I had been in Ho Chi Minh City for five months when riding my motorbike home along the river that evening, with a smile from ear-to-ear, I felt for the first time like an integrated part of the city. I had become part of the hustle, the smells, the culture, the beat, no longer an isolated observer of them. For the first time I felt at home not just in the city but within myself…. I had already banked all of the money earned from my five months at BIS, living off of only my tutoring income. I then quickly reinvested it in a number of crowd-funded companies after receiving news that another investment was due to pay out, it didn’t. This left me back where I started financially and extended my stay in Ho Chi Minh City. Little did I know that it would be a journey altering extension. Life was good but at times I felt a bit isolated and for the first time, lonely. I stopped drinking alcohol (again) in 2014 which meant I felt awkward at the social gatherings I used to love getting to know people through. There’s nothing quite like a few drinks to expedite the process of getting to know people, but as a non-drinker there seems to be an invisible yet tangible barrier between whose who do and those who don’t. I’m sure most of this is in my head, but I also remember my own feelings towards non-drinkers when out on the razzle. After a certain point in the evening the dos and don’ts function on different wave lengths, or at least I certainly did! As has been the case throughout this journey whenever I start to need something: food, water, a bench, a place to camp, a macerating doctor, money, and in this case company, somehow it shows up. This time in the super compact but explosive form of Trinh. 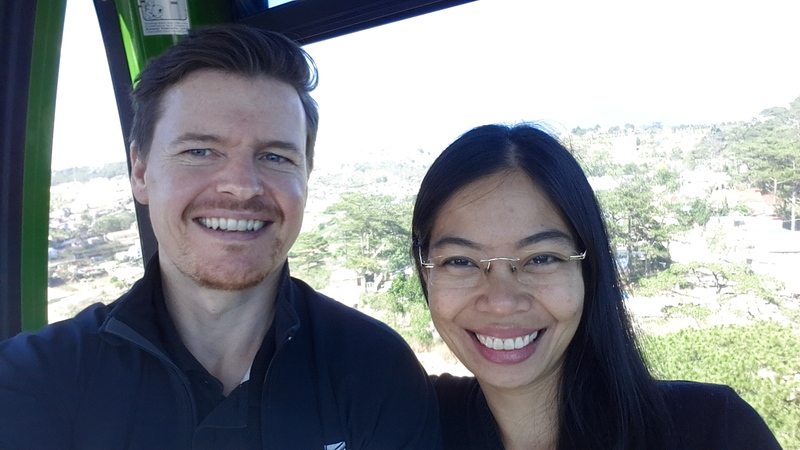 Taking a cable car in Dalat New Years day 2016. We first met in the kitchen of a shared house a couple of days after I moved in. Trinh was eating at pace when I asked her where to put the rubbish. To my surprise and relief Trinh responded with precise instructions followed by, “Soooooo hungry” as she quickly resumed chomping without breathing. I had learnt my first important lesson about Trinh within seconds of meeting her, don’t interrupt her when eating. Later I refined the lesson to, just don’t interrupt her. EVER. After several nights out within groups Trinh invited me for breakfast one morning. I had just eaten and since hauling up in Ho Chi Minh City second breakfasts were no longer part of my daily routine. I said no. Weirdly, despite my periodic feelings of loneliness I still felt protective of my time, or perhaps afraid to get involved. I quickly realised my error and asked her out for dinner that evening instead. Although I pretended to myself that it was just a friendly dinner I knew something about her was causing my mind to think way too far ahead. ….It was late and the road along the river was quiet, only the noise of my engine and intermittent blasts of wayward karaoke screamed by like animals being murdered. We had been going out under the premise of ‘friends’ for weeks mainly due to my out of tune antenna – the one all men are fitted with for receiving the signals given off by women who would like to become ‘special friends’. That, and in all fairness, the none to easy journey across cultural boundaries which by their very nature are lined with relationship ending land mines. But on that night we shared our feelings openly and I made my way home having crossed another border both legs still intact. Given the transient nature of my stay in Ho Chi Minh City we were unsure of how long we would have together but decided to make the most of whatever time we did have anyway. Both in our thirties, we had no intention of starting a relationship under these circumstances but were unwilling or unable to stop ourselves. Finding a single, compatible, unencumbered, sane partner in your thirties is like sieving for gold. You both know what you really want, what you like, don’t like and what you absolutely will not stand for, which filters out most of what you find. When eventually all the dross has fallen through the holes, if you’re very lucky, your left with an unmistakable nugget of pure gold. Having realised what we had found, either consciously or unconsciously, we just moved in together and began planning how we could extend our time together on err… bicycles, obviously. The summer months in 2015 were scattered with just enough tutoring to cover my costs of living. When the new school year started in August my diary gradually began to fill up and within a month I was fully booked at 22 hours per week. Due to the low cost of living and relatively high private tutoring rates I was able to bank more money each month than I had before leaving the UK, good news indeed. 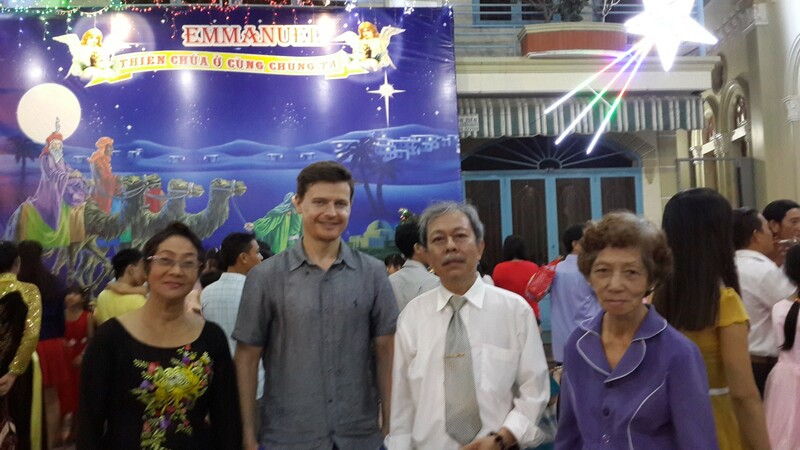 Christmas service at Trinh’s parents local church. Left to right – Trinh’s Mum, me, Trinh’s Dad and Trinh’s Aunt (Mum’s sister). I spent my days continuing to learn how to program computers by enrolling in CS50, Harvard Universities introduction to computer science. It’s a beast to complete and became a fascinating obsession which gradually rewired how I think about, approach, and solve problems. I can’t recommend this course enough for anyone interested in learning how computers work, or how to solve problems more generally. The course material is vast, starts at the beginning and builds in manageable but challenging chunks, and best of all, it’s completely free!! As a result of my new skills the blog will be evolving over the coming months and is currently in a state of limbo as I integrate the changes. I’m aware of most of the issues particularly with older posts but do let me know if you find something funky going on. We saved most of what we earned, Trinh worked as an Executive Assistant to the Global Director of Footwear Sourcing and Development/ Project Manager for Puma (only Trinh could have a title longer than the Global Director), and by the end of the school year were ready to cycle off into the sunset together. We have now been on the road for over two weeks and with Trinh (aka the Pocket Rocket as named by Stewart) on board it promises to be just as challenging as before but in ways that will stretch your imagination to its limits, make your head hurt and your sides split. It’s going to be a wacky old ride for sure. Trinh te tai at Ta Tai, Cambodia. 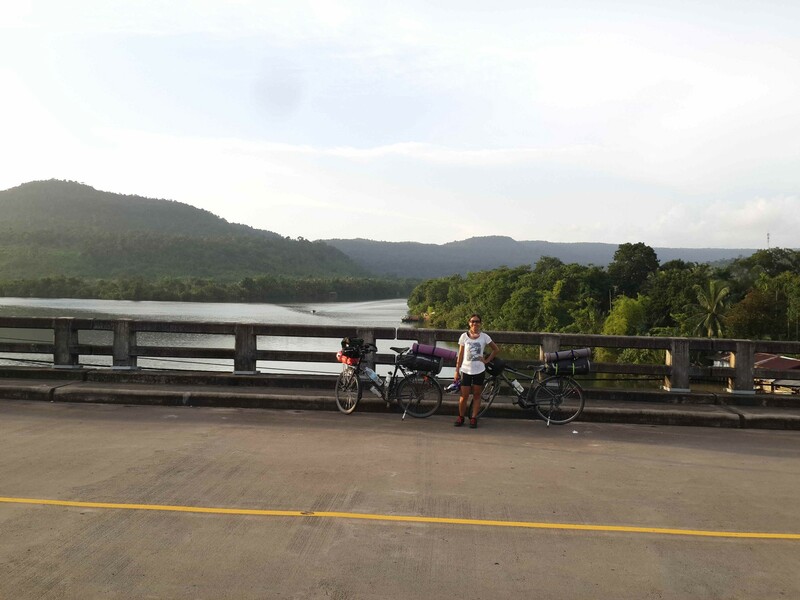 We crossed the border into Thailand yesterday from Cambodia after cycling from Ho Chi Minh City. The route is pretty much unchanged and over the next 12 months we aim to cycle through the rest of Thailand, Malaysia, Singapore, Indonesia, Australia, New Zealand and Chile. At which point we will probably stop to build up the bank again. To the parents that entrusted me with assisting their children in becoming even better at maths and English, and the students that preserved through many hours of my unique approach to learning: Mr & Mrs Dan Nguyen – Rocky, Lyndall and Brett Taylor – Jonah & Campbell, Andrew Homan & Anita North – Sam & Mackenzie, Mrs Ha Minh Hulse – Dan, Mr & Mrs Van Mol – Nancy, Mr & Mrs Allen – Shayla, John & Angela Campbell – Jack and Ben, Cal and Erinn Ramsay – Brooke, Deepak & Christel Rothaug – Ida Maya, Mr & Mrs Lin – Richard, Mr Han & Mrs Ngoc Trong Nguyen – Jenny & Kerry, Michael & Lina Sisovic – Kellian, Mr Tram & Mrs Lam – Duc Anh. It was a real pleasure and a privilege to work with you, I wish you all the very best for the future. Thanks also to Radley for his time and attention finding replacement tutors on my departure, I hope it all works out for everyone involved. Thanks again to Christine and Yvonne in the Learning Development team for their patience and support finding students, and the rest of the staff who welcomed me during my short time at BIS. Will and Lucy for their thought provoking and often hilarious lunch time chats and Sanjay for inviting me into his home so often. And of course, Jenny Andrews for putting me in touch with Nicola Tingey who in turn put me in touch with Stewart Blake. Extra, extra special thanks to Stewart for his hospitality, job, constant referrals, advice, holiday home, ferrying Trinh’s bike and kit back from the UK, and more recently his infectious enthusiasm for the random stuff he finds along the road. My time in Ho Chi Minh would have been very different in so many ways had we not met. I will probably never be able to clear the karmic debt I now owe but I’m inspired to live by your example and give it a damn good go. 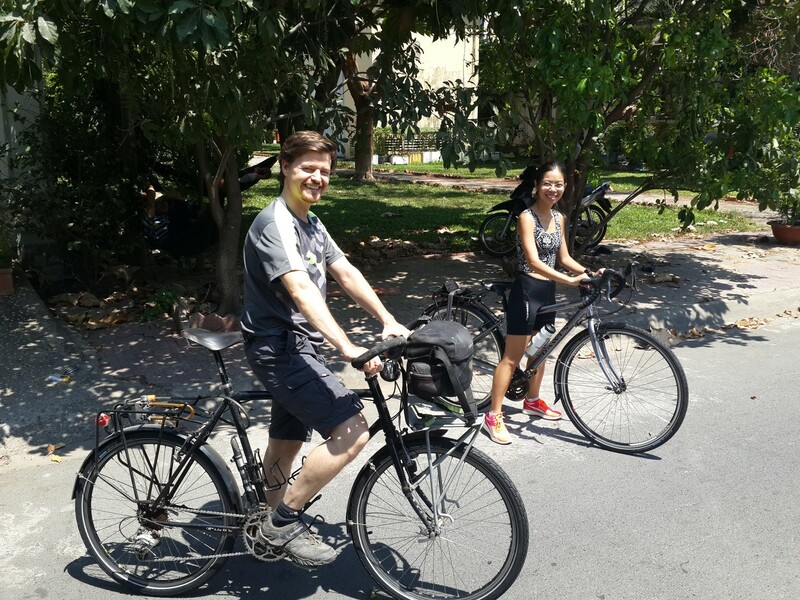 Stewart left Ho Chi Minh City a couple of days after Trinh and I on his own world tour by bicycle. Check out his blog, cyclingstew.com, for meticulously recorded preparations and YouTube videos for hilarious random finds from the road on his Facebook page, Cyclingstew’s world bicycle tour. Please see the Room to Read page for an update on the fund raising effort. The blog will continue as before, however, the writing schedule will likely take a while to settle into a rhythm. Check back regularly for updates or pop your email address in the form below and I’ll let you know when a new blog post is up. Trinh is also writing very regular updates in both English and Vietnamese on her Facebook account, Michelle Trinh, with pictures and unique insights. The English and Vietnamese versions differ so if you’re bilingual you will get a very interesting picture painted in two different tones of Trinh. You should be able to see them regardless of your ‘friend’ status, let me know if not and we’ll find another way to share them. Great read Fraser! Glad it’s going well for you!! Cheers Hutch, all the best to Jenny and bump! Enjoyed the update! Hope you are both well. I look forward to reading the next episode! Thanks Andy, So nice to hear from you, hope all is well with you too. Glad your still with us! Anyway, sounds like you’ve been busy? and don’t leave the updates too long next time…..safe trip! Good luck to you both; what a fascinating story! Thanks Ashley, will do for sure. Good to have you back in the saddle both literally and metaphorically. I really enjoyed reading your blog……………..and with the romance twist to it. Thanks Dave and Sue, it was fun writing again. Great to hear all about the next stage of your adventure Fraser and it is clear that HCMC will remain a very special place in you heart.It has been a pleasure having you mentor our boys and inspiring them with your enthusiasm,knowledge and zest for life.Looking forward to following your journey….good luck! Thanks Lyndall, the pleasure was all mine. Wow Fraser, and hello Trinh! So great to get an update. Just a week or so ago, I was wondering what happed to you. Looks like everything is coming together nicely. I can wait for the next installment. Thanks Jonathan, it’s been a while I know, will definitely be more regular again now. Hi Richard, Kerry, Great to hear from you, I miss you both too. Have a great summer and good luck for the new school year. Thank you for the good luck and we’ll do our best not to actually break any legs!! So good to hear that all is well and that you are setting off again. Missed your updates so looking forward to more tales from your travels. Thanks Geoff, Karen, so nice to hear from you. Thank you for teaching us and expanding our knowledge. We will miss you, but we are happy to hear that you had a great time. Thank you for teaching us for the whole year… well almost but still. We will always miss you for being a great teacher. At fist when i met you i thought this will be fun but it turned out to be even more fun the i even thought it would be so thanks for all the hospitality. Enjoy your journy with Trinh and take care.??? About time buddy.. Can’t wait for more instalments about navigating your way down and through the Pacific.. Keep safe both… Namasté ?? Howdy Fraz B. Stu told me you were on the move again, as an organised tour now, rather than the solo effort. From the Christmas pic. it looks like you were a giant in Vietnam! A new experience for you? All the best with the continuation of the world cyclo-navigation.